The following post is based on a document I made a couple of years ago to circulate to MSc and PhD students I was supervising to encourage them to turn thesis work into papers and to show the process that takes papers from submission to publication. It seemed to me a good idea to recycle this here for a few reasons 1) it might be of use to other students out there who are trying to write papers for the first time, 2) I still use this document, so any feedback from other professionals that I can add in and update would be welcome, and 3) it might serve as an interesting essay for students or others as to the mechanics of writing and publishing a manuscript. I have covered bits of this before in other posts but this is far more extensive and practical rather than a simple review. Biology can be a real pain sometimes – things are just not standard. A carbon atom is a carbon atom, and while it might change slightly with varying numbers of neutrons or electrons, these occur in a limited number of way and with standardised nomenclature. On the other hand, does anyone want to try and define a species? Thought not. Biology is all about continuums from gene pools, cross-breeding, polyploidy and horizontal gene transfer, to populations, individual variation, biogeography, generic and species definitions and most noticeable of all – behaviours. There are ‘carnivores’ that eat plants and ‘herbivores’ that kill and eat animals, arboreal animals that live on the ground, and terrestrial ones that rarely leave the water. No matter what an animal is ‘supposed’ to do, you will always find an exception sooner or later. Not just a species that has broken the mould of its relatives, but even individual animals. While morphology obviously gives us a great deal of information about the behaviour of an animal, it can of course only point us in the right direction. Even a highly specialised tool can be used for all manner of other tasks, even if it is poorly suited to them, if the selection pressure is high enough to retain a specialised shape. Eagles still build nests with hooked beaks, cats and sloths can swim and giraffe graze at ground level when each is clearly poorly suited to the job. These are still all no great surprise really (most birds build nests, most animals can swim, most herbivores will take whatever they can from time to time) but there are behaviours exhibited by both individuals and species that are very well wide of what you might expect. Well after that title, this should really be pretty self explanatory. One thing that is worth noting as it applies to almost every one of these things is just how amazingly convincing some things are. More than once I took pieces to people with years and even decades of field experience and a couple of times a debate ensured over whether or not it really was fossil bone. When you see something at a distance, even just a few metres away, you go and check it out, and while its mostly easy to tell almost instantly once you have picked up the item in question, it is still a pain. When that means a long walk or a tricky climb to get to some inaccessible smudge that might just be bone, it can get very annoying and waste a lot of your time. And of course it is very easy to do, since you are actively looking for bones that might be broken, eroded, distorted and stained or bleached and thus not look mch like what you might expect, meaning you have to check out something that looks only very vaguely like bone, just in case it is. Add to that the huge range of shapes that one does expect (think teeth, jaws, ribs, bits of vertebrae, parts of skulls etc.) and of course pretty much anything white on the surface becomes worth checking out. 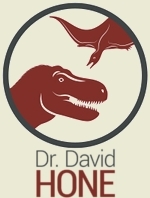 Obviously I am very keen on trying to engage with the public over research in general and dinosaurs in particular but it brings with it an interesting dichotomy of my relationship with both my fellow academics and the public at large that is worth expounding on a little. There is a little Jeckel and Hyde going on really as a result of the way both parties (academics and the lay public) act with respect to the other, and me being one of those trying to bridge that gap often left frustrated with one or the other or both, thanks to the fundamental unreasonableness of members of both camps. There is, as promised, quite a little flurry of posts today and with my e-mail backlog finally cleared and most of the more important work off my desk till tomorrow morning I can try and do some real writing. Sadly for many, I suspect this first post will not be especially fascinating – I’m not going to talk about anything we found, I don’t have my photos on me currently so it’ll be image-less, I’ll not even mention where we were (geologically, temporally or geographically) and I rather think that readers will either be well aware of the issues I’ll be tacking, or will find their glorious illusions shattered. What I do want to do is simply jot down a few quick observations about the field. As I mentioned before, I have only done some very minor prospecting in the German Triassic marine beds and cast some footprints in Peru, neither of which is especially ‘typical’ for someone who really likes big whole skeletons of big dinosaurs so he can get to grips with whole animal biology. Thus getting out into an area famous for producing lots of big, complete, high-quality dinosaurs is actually quite a change, and over quite a period of time, with a decently sized and experienced field crew. At some point I will do a post on what we did, and when, and where and with who etc. and another on the actual ‘what happens on a dig’ post (with my now minimal experience) but this is limited to just some of my notes as to things that were not quite what I expected. Mostly these are clearly because I had never really thought about them that much and hindsight is rather 20-20 so it may not surprise people to learn them at all. Finally, it may not actually be that typical an experience either – I don’t exactly have much to compare it to! Another photo from the IVPP outstation though this one was taken back in 2006 during my first trip to China. This box was tucked away in a storage room and was basically full of left over cast parts from various exhibitions and displays. I know Hollywood stores most of it’s props from films in case they want to be reused, but I doubt even Jurassic Park left bits like this behind. I’m not even sure what’s in there, I think it’s mostly Sinraptor, but there appears to be an ornithopod foot in the lower left and one bone certainly looks like a pterosaur femur. It would certainly make for an interesting anatomy lesson – a jigsaw puzzle with no picture, and probably parts missing and others added incorrectly. Oh, and you need about 3 tons of steel to hold it up while you work out the details. Now, where did I put that welding mask? Another picture and not much text and not much point (rather like Andy Capp). Anyway, I was out at the IVPP’s satellite facility a few weeks back and took a few photos which I will put up when time allows and I have nothing else on hand. 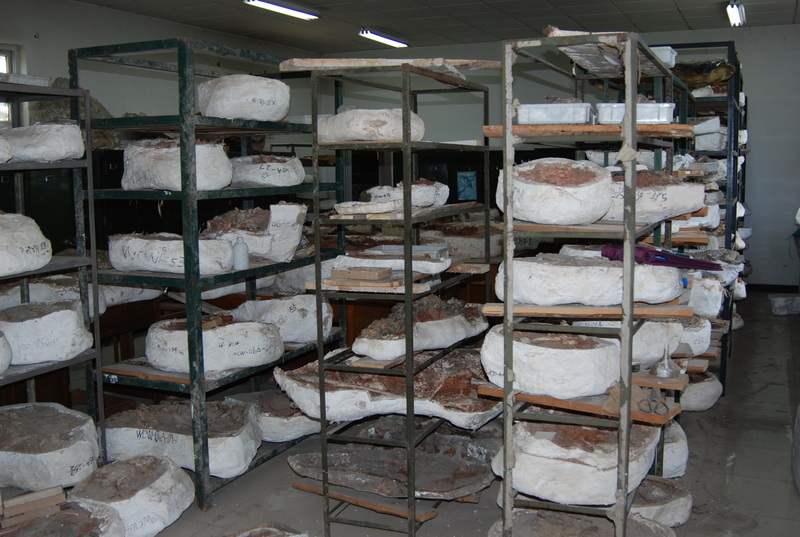 Sadly it’s not where satellites are made, but where large specimens are stored (like sauropods), casting and mounting equipment, and unprepared field jackets of specimens. Here you can see the large collection of pieces from previous expeditions in various states of preparation. Most of them have been opened up so you can see what is inside, but little has been done beyond that. 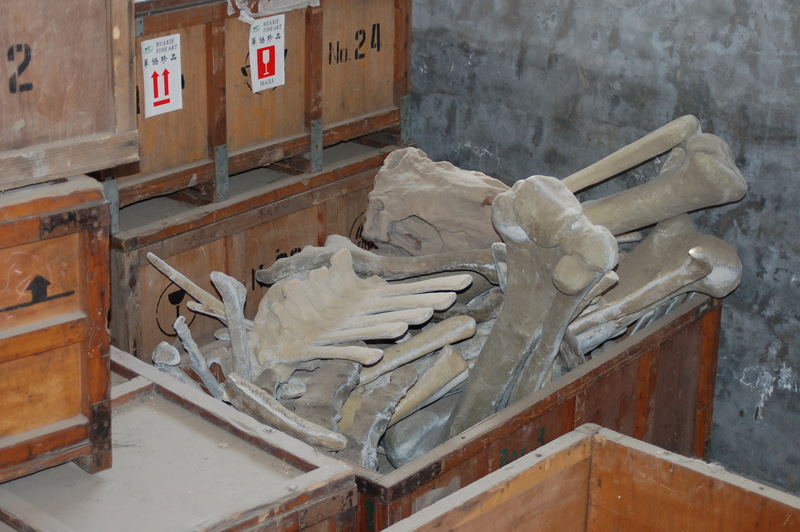 As you can imagine it is a room of treasures, with various undescribed dinosaurs and bits of crocs, pterosaurs and other goodies vying for space in the cramped rooms. My guess is there is work here for a dozen preparators for a couple of years, and this is not the only room like this. And now there is a fair bit more coming back as a result of the latest IVPP foray into the field. Well, apart from the endless hold-ups and issues of trying to get into Beijing from 1000 km away during the olympics – joy. Still, I made it back yesterday and have been desperately catching up on 3 weeks worth of e-mails since, plus in less than a week I am off to Mexico for a full month with my ptero-buddy Dino Frey. As a result you can probably gues how busy I am with both a backlog of stuff to clear out and various upcoming things that I want to try and take care of before I leave. As promised you will shortly get a flurry of posts of things I held back during my absence and I suspect I will have better internet access in Mexico than Inner Mongolia and thus hopefully I can put up a post or two when we cross through some towns and cities. I will at least try and get a few posts up about the fieldwork with some pretty pictures but do bear with me and remember that I will shortly be away again and this time for longer.